Did you know women make most of the health decisions for their families? Nearly 90 percent of moms oversee the health of their children, as well as their spouse, parents and in-laws. That’s a lot of responsibility, considering 70 percent of U.S. women with children under age 18 also work. It’s no wonder that many women don’t do — what they know they should — to keep themselves healthy (because they lack time). The Circle by Providence app is a personalized tool that helps pregnant women and moms manage their health and the health of their children. It’s free and available for everyone! Expert articles about childbirth, babies, pregnancy and parenting. Answers to your breastfeeding questions with videos, articles and a guide to local resources. Information about classes and groups for new moms and moms with older children. A to-do checklist from Providence experts to guide you through every stage of pregnancy and motherhood. Health-tracking tools so you can update providers about your pregnancy and growing child. Appointment reminders when you connect to MyChart through Circle. Support for users with more than one child. More than 1,000 articles to answer questions and support kids’ health through age 18 from best-in-class sources: American Academy of Pediatrics, Nemours Children’s Health System, StayWell and Bright Futures. Topics include everything from acne and asthma to STDs, warts and Zika. Parents can also get advice on tricky situations, such as sexting, single-parenting and how to help a child cope with death. To-do items listed in a users’ home feed for each child and moms-to-be, along with individual trackers for themselves and each child. 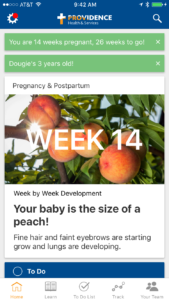 If a mom has connected her Circle account to MyChart while she’s pregnant, her new baby’s information will automatically import into Circle so she can get timely reminders and information. 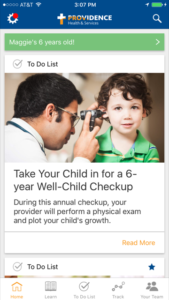 Circle also has a vaccine tracker for kids that follows guidelines from the Centers for Disease Control. The tracker offers reminders when a new set of vaccinations is due. Moms can easily export a summary for sharing and work with their providers to change due dates if they have concerns. It’s easy to download Circle to your smartphone, and it’s free. Go to the App Store to download to an iPhone, or Google Play to download to an Android device.